emancipated patients: should a doctor help you die? Contributing Writers & Artists Rita Allen Kathy Anderson Sally Cooney Anderson A.E. Bayne Diane Bachman Laurie Black Tracy Blevins Melvin Brown Kevin Brown Marie Callahan Collette Caprara Meghann Cotter Elaine Ellis Isabel Faust Christina Ferber Madison Fernandez Frank Fratoe Mary Beth Geil Joan M. Geisler Jon Gerlach Lou Grahamm Lou Gramann Alexis Grogan Sue Henderson Cathy Herndon Ralph “Tuffy”Hicks Donna Hopkins Karl Karch David C. Kennedy Jo Loving Ross McCullough Wendy Migdal Pete Morelewicz Vanessa Moncure Patrick Neustatter Sarah Perry Michelle Pierson Gabe Pons M.L. Powers Gerri Reid Rob Rudick Casey Alan Shaw Brian Shumay Patricia Smith Josh Stansfield Georgia Strentz James Kyle Synder Tina Will Jeremiah Ward Laura Westermier Dawn Whitmore Norma Woodward Front Porch Fredericksburg is a free circulation magazine published monthly by Olde Towne Publishing Co. Virginia Bigenwald Grogan, Publisher. The mission of Front Porch Fredericksburg is to connect the diverse citizenry of Fredericksburg with lively features and informative columns of interest to our community’s greatest resource, its people. Messages from our readers are welcome. All submissions must be received by e-mail by the 19th of the month preceding publication. Writers / Artists / Photographers are welcome to request Guidelines and query the Publisher by e-mail. Front Porch Fredericksburg PO Box 9203 Fredericksburg, VA 22403 Ad Sales: E-Mail: frntprch@aol.com Web Site: www.frontporchfredericksburg.com Facebook: @Front Porch Fredericksburg The opinions expressed in Front Porch Fredericksburg are those of the contributing writers and do not necessarily reflect the opinion of Front Porch Fredericksburg or its advertisers. Copyright 2019 Olde Towne Publishing Co. All rights reserved. rappahannockpops.org/product/popsspring-concert. According to Jaden, “I love performing and testing myself. I perform to include singing and acting.” His advice to others is to “have fun with it”. His family and numerous music teachers have provided support and inspiration. He attributes his first piano teacher, Toni Maxine, persuading him to try singing. Once he began singing, he was inspired by another teacher, Cathy Hoskins, to incorporate expressive acting as part of his performance. It is impressive how Jaden’s musical talents have developed over a short period of time. His father recalls taking the video game system away (destroying might be more accurate) due to subpar grades. At that time, Jaden was nudged to find another passion. Jaden chose learning to play the piano. Seven years ago , he started taking lessons from a local teacher and performer, Toni, (http://voicelessonsfredericksburgva.com. ) She has been a true inspiration to Jaden along with other students. She reflects that “Jaden would ride his bike over to my house for his beginning piano lessons. He would complain about how exhausted he was and how his “arthritic hands” needed a break! To say that he was thrilled with the idea of lessons would hardly be true, but over time he began to actually enjoy playing the piano. Now he will play the piano for many hours without any complaints of his “arthritic hands.” Jaden was exposed to the musical performing atmosphere at a young age. When his father filmed recitals for Toni, Jaden would assist by handing out the recital programs. He has graduated from distributing programs to being a performer with his name listed in the program. Toni also reflects: “Since that first recital when he accompanied himself at the piano, he has grown into a young man who has sung in several musicals, studied Italian to improve his classical singing skills, performed in and won several competitions and he has added bass guitar lessons to his musical interests. He has truly embraced many aspects of music and it has been rewarding to watch him grow and develop.” Jaden plans to continue this passion after high school in the college setting. Mary Beth Geil is a student of life. She lives in Spotsylvania and works at Naval Support Facility Dahlgren. Photography by Melvin Brown & Jaden’s proud father. Rappahannock Pops Orchestra Spring Concert Saturday, March 30, 7pm James Monroe High School Tickets http://rappahannockpops.org/product/po ps-sspring-cconcert/. photo by Laura Westermeier “Belmont” Since 2009, when the Virginia Coastal Zone Management Program launched the 'Plant Virginia Natives' campaign, huge progress has been made in educating the public on the need for, and benefits of, using native plants in the landscape. Virginia Cooperative Extension (VCE) and Extension Master Gardeners (EMG/MGACRA) are continuing to lead the way to help tip the balance in favor of planting native shrubs and trees by offering its 7th annual "Living in the Garden" symposium titled 'Wild About Natives' on Saturday, April 13, 2019 from 8:30 a.m. to 3:30 p.m. There are many GOOD reasons to join us , when the doors open at 8:30 a.m., but pre-registration is required and ongoing right now through March 31. The schedule, registration form, and speaker bios are on our website: https://mgacra.org. Come enjoy Gari a day at Melchers Home and Studio (Belmont estate) in Falmouth, VA to hear from four excellent speakers on which plants to choose, and how and why these plants will benefit our ecosystem all the way to the Chesapeake Bay. Come for …the speakers who have great knowledge of plants, a passion for gardening and caring for our environment. They have years of experience that they are ready to share with us. Come for all of that and …for a chance to walk the beautiful grounds…for fun, gardening fellowship, and inspiration as we head into this year's prime growing season. Barbara W. Ellis: Diversity in the Native Garden. Gardens, large or small, should have great variety for many reasons. A range of options will be presented-from simple steps to ambitious projects-that gardeners and homeowners can take to create beautiful, more sustainable gardens and landscapes that are attractive and healthy for humans, wildlife, pets, and the environment as a whole. Beate Ankjaer-JJensen: Benefits of Using Native Grasses in Wildlife Habitats. Thanks to the dedication of Beate Ankjaer-Jensen, Cultural Resource Manager of Gari Melchers Home and Studio, Melchers estate was one of the first historic sites in Virginia to create large-scale native grass fields in 2000. Mrs.
Dr. Robert Lyons: Native Color Palette. Since many home landscapes continue to rely too heavily on non-native species of plants, Dr. Lyons, will discuss the native plant color palette, and enlarge our scope of possible native plants to enjoy. Carol Heiser: Home Town HabitatEducating Local Communities. Do you enjoy native birds and butterflies? Learn how to establish a native plant habitat in an entire neighborhood. Our landscape choices impact local wildlife; native plant species provide the right types of pollen, seeds, and fruit. Redbud Join us on April 13th at Belmont estate and get fresh ideas and encouragement to choose some new native plant species for your landscape. Just remember to register in advance as seating is limited. Tina Will has volunteered with MGACRA for 13 years and lives near Ferry Farm in Stafford County. Beate Ankjaer-JJensen Ankjaer-Jensen will describe that process and discuss the environmental, economic, and social dimensions of using native grasses in sustainable, wildlife-friendly landscapes. sharing her passion: judy muffley By Kevin Brown There are people who are passionate about photography, and then there is Judy Muffley, who is PASSIONATE ABOUT PHOTOGRAPHY! Judy has become a major contributor to the Fredericksburg photography scene, sharing daily testimonials to the beauty of our city and surrounding region. Greens Community Yard Sale? You know what they say, “One man’s trash is another man’s treasure.” People can bring items to sell ranging from books (for children and adults), to old cds and movies, games, household appliances, old furniture, tools, and baby items. Who knows what treasures you’ll find to sell? Hello! I’m Jeremiah Ward and I am working with Madison Fernandez as the new Downtown Greens Events Interns. Downtown Greens is a non-profit organization here in Fredericksburg whose vision is to promote community development through the two urban green spaces we maintain at Charles and Dixon Streets. These areas, known as the Upper and Lower Gardens, are open to the public 365 days a year, from dawn until dusk. Please come visit! This year, Downtown Greens has a number of new events on the calendar. In response to many neighbors’ and friends’ requests, we are excited to announce our upcoming Community Yard Sale. This event will take place from 8amnoon on April 6th, 2019, rain date April 13th, in the Upper Garden at the corner of Princess Anne and Dixon Streets. It will be a great opportunity for getting to know your fellow neighbors while you clear out things you no longer want or need. For a fee of $10, Downtown Greens will provide a 10’X10’ space for each person or group wishing to participate. These fees will go directly to Downtown Greens, helping us plan more awesome events for our neighbors in the future. Participants may reserve up to 2 spaces each. All proceeds from sales go to the participants. Sign up soon! Then bring your own table or tarp, and good stuff to sell and get ready for a fun spring-cleaning event! Being introduced and immersed into the Downtown Greens family has been a whirlwind - but a wonderful experience. Seeing how projects come to life when they began as conversations in an office is a great sight to see! Large or Small, I Sell Them All! Dreaming of Fabulous City Living? Let’s Make It Happen! VA 22401. Only 50 spaces are available, so reserve your spot before they run out! Payments must be received by April 1st, 2019. We are super excited to host this first-ever event and we hope all of our downtown neighbors will get involved. We work hard to provide accessible events to our community and we are also looking for your help in spreading our mission. Be sure to invite your friends and family to events, the more people the better! Reserve your space today! We look forward to shopping with you on April 6 at the first-ever Downtown Greens Community Yard Sale! Jeremiah Ward and Madison Fernandez are part of Downtown Greens fabulous spring intern team from UMW. explore these fragile and resilient ecosystems.in your own backyard and around the world. Through Wild & Scenic you will learn about sustainable farming practices, the magic of wetland mud and life at the bottom of the Grand Canyon. Come and run up Mount Washington with 96 year old George Etzweiler, track animals in the snow using DNA, sail to Hawaii on a raft of recycled water bottles and visit the sand dunes of Hammocks State Park in North Carolina. Wild & Scenic will show you how the everyday actions of people like you can overcome seemingly overwhelming environmental challenges facing our planet. bald eagles and atlantic sturgeon. Your support of this festival will help FOR continue this important work. So shake of your winter blues and join us at the 9th Annual Wild and Scenic Film Festival on Saturday, March 23 from 5:30 - 8:30 p.m. in Chandler Ballroom in the University Center of UMW. Admission is $15 paid in advance at riverfriends.org or $20 at the door. Students are free of charge. See you there. to set your reminders for these future opportunities to meet local authors and hear them read and talk about their books as process: Mystery, Thriller, and Suspense @Red Dragon Brewery March 10, 4-6 6 p.m. Non-ffiction and Historical Fiction @Red Dragon Brewery April 14, 4-6 6 p.m. Children’s Book Authors @Wiggle Worms May 5, 2-4 4 p.m. We’re excited to return to the downtown area with new ways for the community to interact with local authors throughout the year and continuing support for independent publishing in our region. Register your space today at www.fredbookfest, and follow us on Facebook and Instagram to get the latest information as it’s happening. A.E. Bayne is an organizing partner in the Fredericksburg Independent Book Festival and the publisher of Fredericksburg Literary and Art Review. Photos by Michelle Pierson. also enjoy shopping in downtown Fredericksburg on Caroline Street, going to the library, and going out to lunch. “I think we agree that our visit to Eileen’s Bakery and Café for lunch was a favorite for us,” said Evadine. Marietta added, “The flowers were in bloom and it was a nice spring day. Evadine had never been to Eileen’s before, but upon entering the building she smiled and proceeded to give us a history lesson, telling us that years ago this building was the First Christian Church where she was baptized and attended services. Evadine is one fine lady. She is gracious, kind, intelligent, and full of wonderful stories of living in Fredericksburg for the last 73 years. Evadine’s stories are limitless.” With regard to the Senior Visitors Program Evadine declared, “There are no negatives. I am not homebound so I am able to enjoy the outdoors with my volunteers. This program gave me the opportunity to get to know Marietta and Mike who have become my friends. I like this program so much that I have told my friend about it.” Marietta remarked, “We would definitely recommend the Senior Visitors Program to anyone who is looking to contribute to the community. It really is a win-win opportunity for everyone involved. Evadine has shown us what it means to age gracefully and do it with a sense of humor, adventure, and dignity.” Laurie Black is the Administrative Assistant for the Senior Visitors Program She can be reached at mhafaa@mhafred.org To learn more, call the Senior Visitors Program at (540) 371-2 2704 or visit our website at mhafred.org. Refer a senior or sign up to be a volunteer! The Senior Visitors Program is a free community service program of Mental Health America of Fredericksburg. available - the commercial variety is odorless, tasteless and mostly colorless. A sample recipe from this cookbook. ROQUEFORT MOUSSE from Mrs. S. Otis Bland, wife of VirginiaCongressman Bland 1933 ¼ lb. Roquefort cheese blended with 8 oz. cream cheese - place in mold and chill. Make 2 cups of jelly by dissolving gelatine in one cup cold water then adding canned beef bouillon. Heat to boiling point. Chill until almost congealed. Turn out cheese mold, then cover with jelly, pouring it down the sides. Chill. To serve: turn out onto platter lined with heart lettuce and Russian dressing, add bits of extra jelly, chopped. I think this would go well with grilled tenderloin of beef. FRUITY JELL-O O AND VEGETABLE JELL-O O My ancient recipe book suggests all flavors of Jell-O with most fruits - you cannot use raw pineapple as it will not gel. This CAULIFLOWER RADISH SALAD recipe is real. I’m wondering if the testers actually tasted! “A colorful jewel of a salad that will crown your meal regally!” Dissolve 3-oz. pkg. Lemon gelatin with ½ tsp. salt in one cup boiling water. Add ¾ c. cold water, chill until very thick. Combine one cup diced radishes, ¾ cup chopped raw cauliflower, 4 tsp. Vinegar and one tsp. grated onion and let marinate about 20 minutes. Pour into six individual molds and chill. Unmold onto salad greens. AROUNDI’m hoping to see RING-A THE-T TUNA on everyone’s spring buffet luncheon table. You may see your guests running from the table, however. “A beautiful jewl-like entree salad for your luncheon or buffet table.” Dissolve one 3oz. pkg. lemon gelatin and ¼ tsp. salt in one cup boiling water. Add ¾ cup cold water, 2 T. vinegar, 2 tsp. grated onion. Chill until very thick. Stir in ½ cup each diced cucumber and celery, 2 T. each pimientos and stuffed olives and one 7-oz. can drained tuna. Pour into 4 individual or one quart ring molds. Chill until firm. Unmold onto crisp salad greens. Spoon additional tuna in center and top with mayonnaise. Really. Straight from First Edition “Joys of Jell-o”. Vanessa wants to hear from anyone who has a favorite Joys of Jell-o recipe...seriously! You can make this St. Patrick's Day classic in under two hours, thanks to the pressure-cooker setting on the Instant Pot. It yields succulent corned beef and tender cabbage every time. Serve with rye or rustic bread for sopping up all the delicious juices. 1 flat -cut corn beef brisket, trim excess fat 1 teaspoon mustard seeds 1/2 teaspoon juniper berries 2 dried bay leaves 1 yelllow onion peeled & quartered 1 ½ pounds carrots, peeled & cut into 3 inch pieces ½ head green cabbage (approx 12 lb) quartered lengthwise 1 teaspoon black peppercorns ¼ teaspoon allspice berries (approx 6-7 berries) 3 cloves garlic peeled & smashed 1 ½ lbs small red potatoes whole grain mustard 1. In a mortar and pestle, coarsely crush mustard seeds, peppercorns, juniper, allspice, and bay leaves (alternatively, place in a resealable bag and crush with a rolling pin). Add to the bowl of a multicooker, along with brisket, onion, and garlic. Add enough water to completely cover brisket, about 8 to 10 cups. Secure lid of multicooker. Cook on high "Pressure Cook" setting for 1 hour, 25 minutes. Once time is complete, turn off machine and manually release pressure; carefully remove lid. Using tongs, transfer brisket to a cutting board; tent with foil to keep warm. 2. Add carrots, potatoes, and cabbage to bowl of multicooker. Secure lid, readjust pressure valve, and cook on high "Pressure Cook" setting for 5 minutes. And end with.....Irish Coffee Irish Coffee is one of the simplest and oldest recipes for a coffee drink. It blends coffee with Irish whiskey and either sugar or Irish cream. It's a wonderfully bittersweet hot cocktail that's perfect for after dinner or as a nightcap (but you might want to make it with decaf coffee). Ingredients 1 1/2 ounces Irish whiskey 6 ounces of hot, strong coffee Whipped cream Optional: 3/4 ounce Irish cream, or a teaspoon of brown sugar Pour the whiskey into an Irish coffee mug. Put a spoon in the mug and pour in the hot coffee - the spoon somehow magically keeps the glass from breaking due to the hot liquid (don't ask me how, just enjoy the laws of physics). If you're adding sugar, do it now and stir until it dissolves. Add the whipped cream on top. Garnish with coffee beans, coffee grinds or brown sugar sprinkles. acidity means that the grape can hang late in the vineyard while retaining that acidic brightness as the grapes become shriveled and the sugars concentrated. The lateharvested grapes can be made into outstanding dessert wines. Wines from Petit Manseng will usually be highly aromatic, with aromas and flavors of peach, citrus, mango, passion fruit and pineapple. There are many producers of Petit Manseng in Virginia including Michael Shaps, King Family Vineyards, Stinson Vineyards, Lovingston Vineyards, Glen Manor Vineyards, Grace Estates, Linden Vineyards, Granite Heights and many more. Brush Strokes Gallery featured artist Norma Woodwad, "Life in Monochrome", opening reception, 6-9pm, 824 Caroline St.
WORKSHOP, Individual attention and critique by outstanding artist/teacher/juror Joseph DiBella, Bring two artworks for critique. Snacks & beverages furnished. Lunch on your own. Class limited to 15. 9am-3pm. Info: Joseph DiBella 703855-1951 jdibella@umw.edu. FCCA 813 Sophia St.
Art First featured artist Ben Searles, "The Journey". Also BONUS, legendary musician Gaye Abegbalola will be performing! "Art of Protest: Protesting from the Side of Love" thru April 28, Unitarian Universalist Fellowship Gallery., 25 Chalice Circle, Opening reception 11:30 AM -1:30 PM. free, open to the public. "League of Earth's Angels - Kickoff meeting welcomes new members and participants. The League of Earth's Angels is a local women's circle of the GlobalSisterhood.com community. Our motto is: "Women who protect the Earth and uplift each other in spirit". 7:30pm at the Howell Branch Library, 806 Lyons Boulevard, Room #5." Speakers Series, CRRL, Main. Mark Maloy, a historian National Park Service "Hugh Mercer and the battles of Trenton and Princeton in the Revolutionary War" 10am Theater Room. Dietitian for better and Mary Stafford Stafford. Show & Sale, 10am - 8pm agne Reception 6pm-8:pm, ity Center, 408 Canal St. . eds will benefit the Safe Center. Children's Art Show. 10am-8pm, Dorothy Haart Community Center, 409 Canal St.
Painting for the Birds - Mixed media class by artists Karen Julihn, using provided source material of birds to create 2 paintings. Artists Alliance Gallery, 100 Taylor St Colonial Beach, Va, Information: kjulihn@gmail.com, 540 207 0814 Children's Art Show. 10am-4m, Dorothy Haart Community Center, 409 Canal St.
several years. In 1975, the organization sold it to a private owner, although HFFI maintains a perpetual covenant, or easement, on the property. Since then, the house has been sold to several people who have operated businesses out of it: a bridal shop, a bakery, and most recently, an accounting firm. You can see the beautiful interiors in a marketing video on YouTube created by a realty company. In contrast, at 1407 Caroline Street (above left) a bit of sidewalk leads to nowhere, mute testimony to the two-story Georgian style house, originally constructed about 1787, that once stood there. The Civil War was especially unkind to this home, but it appears to have been almost completely rebuilt by 2 years after the war. However, the 21st century witnessed the demise of this house. First, a storm-related fire in 2003 damaged it, and it sat vacant for 7 years. Another fire in November 2010 struck the death knell. The following February, the city declared the structure unsafe under a state code, which gives the owner the right to tear it down. He did just that in June 2011, prompting a vigorous protest and the passionate resignation of the president of the Architectural Review Board. But perhaps a phoenix will rise out of the ashes. Although a house has yet to be built on that site, the city and HFFI work to prevent "demolition by neglect” so there are no future irreplaceable losses. To support these efforts, become a member of HFFI by visiting HFFI.org to join. Wendy Migdal is a volunteer at the Historic Fredericksburg Foundation, Inc.
1980, as a y o u n g w o m a n C h e r y l bought the business and has lovingly operated it there ever since. Everyone knows Battlefield Restaurant. It sits in the perfect location. When still open to vehicle traffic, the Sunken Road connected with Lafayette Boulevard at the base of the National Cemetery and directly across the street from the restaurant. Anyone entering Fredericksburg today by way of the Lafayette Boulevard corridor passes between the Fredericksburg Battlefield Visitor Center and the Battlefield Restaurant. Battlefield Restaurant is the epitome of a family business. Cheryl's daughters and two grand-daughters work there and Susan, the grill cook, grew up with Cheryl's daughters. This place feels like family, because, well, it is. I asked Cheryl what she enjoys most about the restaurant. "My customers are awesome" she says, "just really good people." She especially values the opportunity of knowing generations of customers. She's served couples before they had children of their own, and later their children started appearing, and today even the grandchildren have become regular customers. I first ate here in the late 1960s when my family brought us to Fredericksburg on vacations. I took Mitzi there to meet the "Battlefield Gang" when we started dating. Most of the Battlefield Gang came to our wedding. Since then, we have introduced our children and grandchildren to the restaurant. I wonder how many generations after us will come here too. Asked if she ever plans to retire, Cheryl shakes her head and quips emphatically: "I'm gonna work 'til I can't walk no more." My bet is on Cheryl being there for a very long time. Battlefield Restaurant, like so many buildings in Fredericksburg, exudes a sense of place that reflects a vibrant, friendly community. Here, you can sit at the counter and watch as the cook prepares your meal, make a new friend or two, and hear about the latest goings-on in the 'Burg. Open seven days a week, Battlefield Restaurant is popular for its home-style cooking. The pancakes and omelets are a favorite, along with tasty specials such as homemade meatloaf and potato soup. I won't stop coming here until I just can't eat anymore. So â&#x20AC;Ś what's in a Family? Here, a long and wonderful tradition of hometown cooking and really nice people. Senior Care luck, genes or something else Dog Walking Pet Sitting Companion Play Time & Mini Furies, Too! intellectual activity, a good sense of humor, religious beliefs, strong connections with other people, and a zest for life. One key finding was the phenomenal ability of centenarians to cope with diseases as they age. They avoided age-related disabilities even though they had age-related diseases. In other words, they are resilient, a key to effectively coping with life’s curves. We know as we age, we lose some functionality and change physically. We experience cognitive changes, taking longer to process information and make decisions. But, getting old can be a good thing as we gain in other ways. We view things from a different perspective, accumulated over years of life experiences. I have no control over my genetics or luck, good or bad, or whether I am somehow randomly selected to live a long life. I can only focus on things within my control such as physical, psychological, social, and life-style changes that impact me. For me, one new thing is that I enrolled in a flexibility training class called “GOLF Joy” and quickly learned how physically inflexible I really was. This class has taught me that I need to continually push my body to remain as physically active as possible. Preparing for this article has helped me understand my need to focus on the promise of aging rather than the problems of aging. Doing so can not only lead to a more rewarding life, but also a longer life. So, to me, a longer more fulfilling life is more than genes and luck – it is something else. Karl Karch is a Gerontologist and local franchise owner of Home Instead Senior Care, a licensed home care organization providing personal care, companionship and home helper services in the Fredericksburg and Culpeper region. help balance the meridians, the organs, and the entire lymphatic system. Stimulating these points helps to support the flow of lymph throughout the body and get rid of any built-up toxins. Be sure to rub these points with deep pressure, and if they are sore, that is a sign that they need to be worked with a little more. You can work with the Liver NL by rubbing under the right breast, and Gall Bladder NL is located near the center of the chest. See the diagram for exact placement. Each meridian has a Source Point that it is connected to the organ energy it is associated with. To stimulate these points, you can stretch, tap, twist, buzz or massage them, or simply hold them for one to two minutes. Both LV and GB source points are located on the foot. See the diagram for their locations. One of my all-time favorite EEM exercises, The Blow Out, helps to release emotional toxins and can help you let go of built up anger and frustration. To begin, bring your arms to either side of your body and make fists, imagining that all your frustrations and negative feelings are in your hands. On an inhale, bring your arms above your head, and on an exhale, bring them down quickly and open your fists, using the “shhh” sound. Repeat three times and on the last movement, bring your hands down slowly and deliberately and let it all go. I hope that some or all of these exercises help you to experience good health and wellbeing this Spring and stay balanced throughout it. For more information and videos of some of these exercises and more, visit www.itsallenergywellness.com. because they are depressed. There are even fears that this is a form of eugenics – though experience in the states that have approved medical aid in dying doesn’t bear this out. and Choices, and getting involved with a bill proposed by Del. Kaye Kory, Democratic delegate for Fairfax’s 38th district. I am comfortable that the multiple safeguards in place to ensure the person is of sound mind, and is terminal, and that no one is being coerced, are adequate. And no patient or doctor is obliged to participate if unwilling. Also of note is that many of the people prescribed the medicines don’t take them. They are sufficiently comforted that they have an out if needed. The Need You might think, even in terminally ill patients, that any symptom can be managed. Unfortunately that is not always the case. Despite best treatment, pain cannot always be adequately controlled. Nor symptoms like air hunger and nausea. Also, end of life care expert Guy Micco, MD, clinical director emeritus of University of California Berkeley (who teaches a slightly macabre sounding “Death Course”) notes some 91 percent of patients choose medical aid in dying for fear of losing autonomy; 86 percent because of decreasing ability to participate in activities that make life enjoyable and 71 percent because they wanted to die with dignity. My Position In my 49 years of being a doctor I have treated many terminal patients who would have found great relief if medical aid in dying was available. Compassion and Choices note 57 percent of doctors also support the idea – though talking to my colleagues many seem a little hesitant. I was asked to write a rebuttal to an anti-medical aid in dying editorial that appeared in the Free Lance-Star. And write one of several testimonies in support of Del. Kory’s bill to legalize the policy in Virginia. The Role of The Doctor The the American Medical Association thinks “physician-assisted suicide is fundamentally incompatible with the physician’s role.” And that a physician should be a “healer.” The problem is these terminally ill patients are not “heal-able.” So to claim the only role of the doctor is to heal is a bit screwy. I see my role to alleviate suffering – and if this means hastening the inevitable death that illness will cause, so the patient’s suffering is relieved, so be it. I don’t think the moral and religious position of doctors and our legislators should stand in the way. Whatever you think, it seems to an example-par-excellence of an emancipated patient empowerment issue. A case where you should be able to decide for yourself. Patrick Neustatter is the Medical Director of the Moss Free Clinic. nothingness. A photo by Bill JohnsonMiles illustrates the continuing struggles to stop such massacres. The third invited artist is Brenda Simpson, a photographer who always has an insightful eye. At the million person Women's March in January, 2017, she was struck by the men, who wore the pink hats, who brought their children to the March, who proclaimed solidarity with the marchers. The pink hats immediately became the counterpoint to red caps, and had an endearing aspect as well as biting satire. There is a continuing battleground over public memory. I would like to see more artists become activists and more activists employ art to help engage the public. Patricia Smith is a member of the Social Justice Committee and Visual Arts Committee at UUFF and an activist painter "Art of Protest: Protesting from the Side of Love" March 3 through April 28 Unitarian Universalist Fellowship Gallery., 25 Chalice Circle Opening reception Sunday, March 3, from 11:30 AM until 1:30 PM. habitat of the Rappahannock falls. This is a portion of the full piece, which measures 12' wide. Beverley Coates, Watercolorist Penny A. Parrish, Photographer; Lynn Abbott, Oil Painter Daily 10 to 6. As a child, John fondly remembers trips to the San Diego Zoo and skiing in Pennsylvania. Although both of his parents had doctorate degrees, John's mother retired to raise the children. After High School, John went into the Navy and became a deck seaman, otherwise known as a deck mate. He spent two and a half years in the Navy, then went home to his family. "I just didn't like it up in Pennsylvania”, he said. “I was trying to work two jobs and not going anywhere and said 'I got to get out of here," he said. John came to Virginia more than 20 years ago. Although he has had more jobs than he can remember, he usually maintains steady side work in landscaping and carpentry. Consistent full-time employment, however, has been a struggle ever since he got in some trouble in 1995. "I did a lot of messed up stuff when I was a kid, and I guess you just get tired of it and you move on," John said. He spent many years on the street, often moved from place to place and surviving on minimal resources. "My homeless experience was just to stay to myself and find a place to hide where the cops aren't chasing you off all the time," John said. "I had a little portable generator and a little kerosene heater and a bunch of tarps over the tent." Since getting back into housing, John has worked on obtaining full-time employment. He hopes that his pursuits will lead him to a job working outdoors. Last Month’s House: 1601 Sunken Well The Winner of a gift certificate from City Lights Salon is Jeanette McCalment The Tiny House That Could I am only a little bungalow, sitting bravely here on my short street, with my back to the college, very neat, the new-built big boys on the block, sit with me cheek to cheek. Their new windows and doors, and tile so fancy, make me feel so old, and frankly very dowdy. My loved ones appreciate me so, and said to me one day, we think you need some power colors, to make you fell so good, and make the neighbors take notice, of a pretty house like you. FCCA Faces & Figures Exhibit, Ed King juror Members Gallery, Ray Abell & Millie Abell, 813 Sophia St. The Artists' Alliance (AA) at Jarrett Thor Fine Arts is holding an opening reception on Friday, March 8 from 6-9, in conjunction with Colonial Beach's Second Friday Art Walk. Featuring an exhibition by watercolorist Amanda “Beets Me”, Amanda Lee @Art Alliance Lee, "Transparent Watercolor." For info 804 224 7200, 804 224 6007, or 301 452 1333. Vernal Equinox Each spring as snowpacks melt and the sun revives our planet We are given new glory of air and woods gilded with foliage. Should we not seek those out to look upon colors they bring or should we ignore the light which has been restored to us? For this fundamental question people long ago had the answer by honoring a rebirth of life when radiance found them again. Frank Fratoe (Pop-Pop) lives & writes in the city. He has written poems from the heart for Front Porch for over 10 years. By Diane Bachman When I was starting out as a psychotherapist in the 1990s, some of my colleagues made fun of me because I talked about things like meditation and energy. Fast forward to 2019, and it seems most folks are on board with mindfulness, meditation, and things like acupuncture and tapping. Well, by writing this article, I am again taking a bold step into woo woo (though I find that astrology can be very accurate and not so woo woo at all!). This is astrology based upon the language the planets in our solar system speak as they travel through the 12 signs of the zodiac. Indeed, working with what we call your birth chart (a diagram of the heavens at the precise moment of your birth), astrology can be an excellent tool for self-discovery, understanding and personal growth (plus, it is a heck of a lot of fun!). Your birth chart is based upon the date, exact time, and place of your birth. Exact birth time is crucial because out of birth information, your moon and rising signs are calculated. Did you know that your rising sign is important because it tells us how you present yourself to the world? The sun sign shows us how we shine in the world and our moon tells us about how we negotiate our relationships. All of the planets are contained in your birth chart and represent aspects of your personality and life journey: Mercury, Venus, Mars, Jupiter, Saturn, Uranus, Neptune, and Pluto. In addition, many astrologers also figure in smaller planets like Chiron and Eris as well as asteroids like Juno and Vesta. I don't want to get bogged down into too many intricacies because there are some BIG astrological things going on in the month of March. Hold onto your hat! 1) Mercury goes into retrograde from March 5 to March 28 and will do so two other times this year. This does not mean that Mercury orbits in reverse. It means that Mercury, the zippy planet, slows down so it only appears to travel in reverse. Mercury represents communication, the intellect, and sometimes technology. Retrogrades have a bad reputation because they can be disruptive. I like to see retrogrades as a time to slow down and reflect, take stock, kind of a call to mindfulness. 2) Uranus passes from Aries into Taurus on March 7. Uranus has a collective consciousness about it along with a revolutionary kind of electricity. This electric charge can help us recognize new possibilities and step out of the known, many times through abrupt disruptions. So, Uranus is leaving the bold, warrior sign (Aries) and will settle into the earthy, grounding sign (Taurus). Uranus will remain in Taurus until July of 2025. 3) Neptune is in Pisces, Saturn is in Capricorn, and Jupiter is in Sagittarius. This is a once in a lifetime configuration! Neptune takes 164 years to make its way around the sun. This lineup brings the enthusiasm and learning (Jupiter) it takes to recognize our dreams (Neptune) and brings them into devising a way to realize them (Saturn). So there you have it…..March brings much opportunity to slow down, make changes, and begin to realize some of our dreams. #FredStrong What Comes After Physical Therapy? 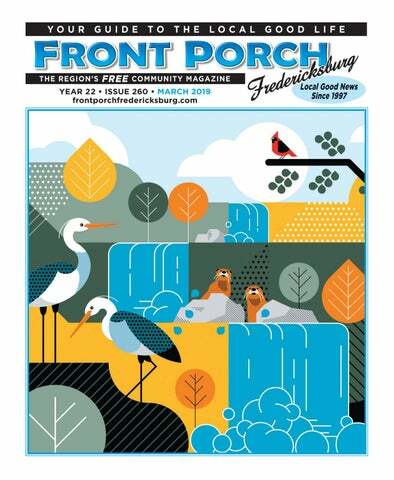 If you enjoyed the illustration on the cover of this month's Front Porch, I hope you'll also enjoy the artwork above. Both pieces are by an artist named Pete Morelewicz who recently moved to the 'Burg. But in that short time, Pete has made quite a name for himself. He has already exhibited at local venues, including a recent solo show at The Sunken Well Tavern. You may have also seen some of Pete's excellent posters he designed for Mainstreet Fredericksburg displayed in the downtown parking garage and on some downtown walls. Pete is one of a number of artists helping to revive the Darbytown area across the railroad tracks from downtown as you can see by the "Darbytown stamp" art he created above. You can find prints of Pete's work at Frame Designs Gallery and at his area in LibertyTown Arts. I'd like to say "Welcome" to Pete from the local artistic community. I can't wait to see how Fredericksburg inspires your future work! Casey Alan Shaw is a local artist. He exhibits his original artwork and limited-edition prints at Art First Gallery and at www.caseyshaw.com. It is really amazing how no matter how bleak, grey and cold a day can be, when you go to our downtown, the sun comes out because of the smiling faces of the merchants in their warm shops. Most of the shops are owned by the people inside the shops. They have selected the merchandise, perhaps painted the walls, their pets visit, sometimes they live above the shops with their family Some people pick our town for their home, on purpose, not just a job Keith Lebor and one of his favorite customers, transfer.They have found a Meg Bohmke gem. They are grateful to Keith's meat products are all find a small town, with the warmth of our Southern hospitality. A very historical especially contracted for locally, and city, big city amenities, top notch colleges, raised for Olde Towne Butcher shop. He hospitals, really nice honest, kind people, visits each farm he contracts, and at every safe for our kids, with compassionate farm checks to see if they are upholding organizations. Fredericksburg, our his high standards for environment and free range farming. hometown! Keith makes sausages and other Food, did I say food! Keith Lebor came here four years meat products for many of our ago wanting to start a small personalized local restaurants, like Spencer Devon, business, and for his family, life in a small (Shawn's beer in Keith's sausage!) he also city. Coming from a long career as a furnishes meat for Kybecca's. You can order delivery for Keith's commercial real estate developer, he wanted to buy a small business, a butcher products online from "Uber Eats.". Everything not sold in the store shop, which seems unusual, but Keith is itself by the expiration date, is donated an unusual, "total food guy." (his words) He is owner of, OldeTowne Butcher, where to Micah. In the basement of Keith's he sells local " fantastic meat,"(my words) butcher shop is a fantastic sandwich shop 80% from local farms, eggs, Earth's Echo chicken, where the chicken live in natural named Ike's. Signature Snadwiches Check free ranging pastures in Bealeton,Va. it out like I did. My chicken salad (Keith's Trickling Springs milk, with free- range own recipe) is the best I have ever tasted, pasture fed cows. All wholesome food so I ran right upstairs and purchased a creations from wholesome local products, container! Keithâ&#x20AC;&#x2122;s family have made meat being his specialty. All of these local products Keith buys, are contracted and Fredericksburg their hometown! Make Old bought from our local farms. He has Towne Butcher, your hometown shop. Don't ' forget to say hi to Keith other delicious foods made in the shop, and his eager staff of friendly local (my favorite is the chicken salad!) plus wine. As you look around the really workers: Cliff, Doug, Greg, Jack, Jessie, attractive welcoming shop, the picture Andy, Sam, Rhoda, Ryan, Kateland, perfect meats, in the historic building, you Johnny, and Matt!" (back next month if I left anyone out!) suddenly feel happy and hungry! Parked my bike by the front Keith, his wife Jennifer and his door,very convenient!! Saw lots of parking family of four children, were all able to move here this summer, which ended for your cars too. Front Porch Magazines Keith's commute to and from N. Virginia. also at the door,ck it out. Keith made this three hour trip daily, for 4 years, while his eldest two children finished high school. The are both in college now,with a daughter at our local University of Mary Washington,and a son at Virginia Tech., with two younger children finishing up in Spotsy schools.